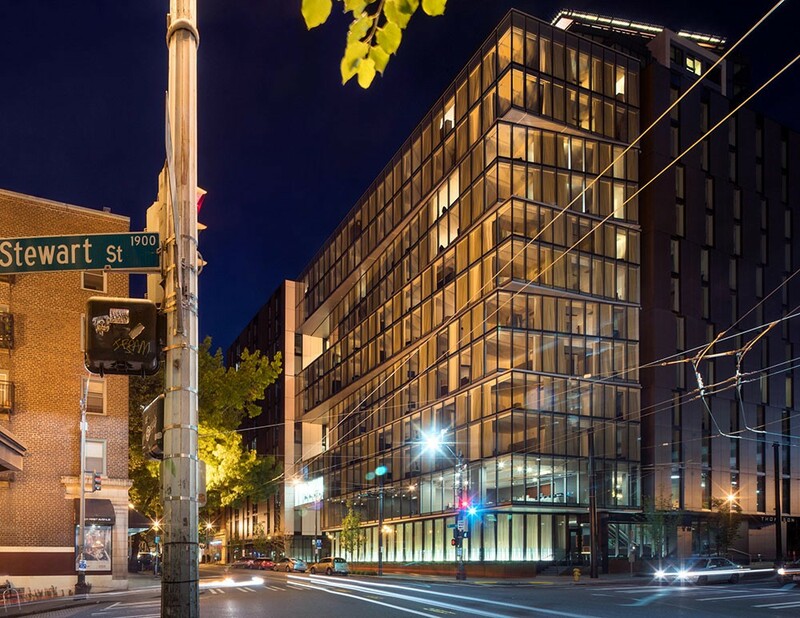 LMN Architects is pleased to announce the completion of the new Downtown Seattle Hotel. The project is a full-service hotel and meetings venue managed by Hyatt Hotels composed of 1,260 rooms, and numerous amenities including ballrooms and restaurants. 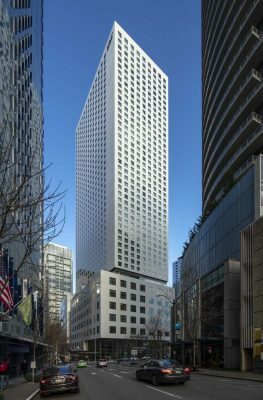 The design synthesizes a variety of urban influences and scales into a mixed-use architectural collage inspired by its position at the intersection of Seattle’s primary commercial and high-rise residential neighborhood adjacent to the new Washington State Convention Center Expansion. The new Downtown Seattle Hotel is a contemporary composition of pure geometric forms hovering over a transparent and inviting street-level public space at the base of the building. 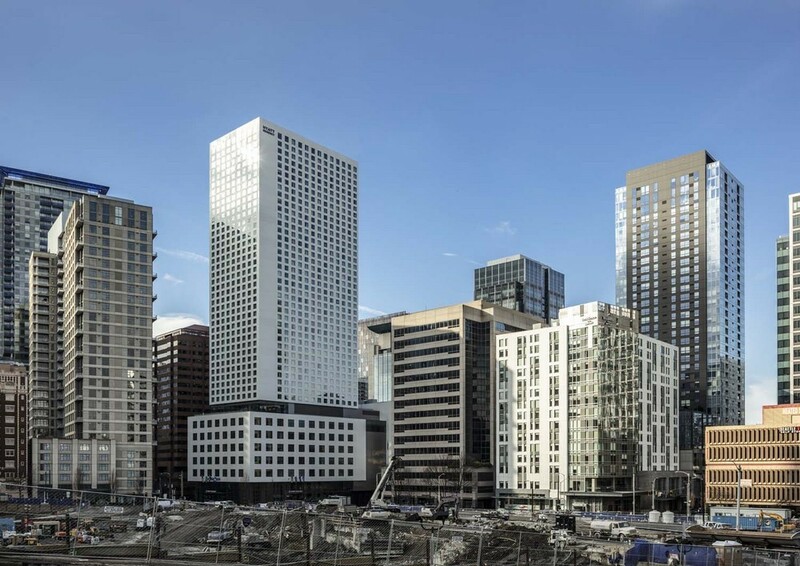 The building supports an engaging interplay between the community and the vast influx of visitors, while anchoring the rapid northward expansion of downtown’s urban fabric. 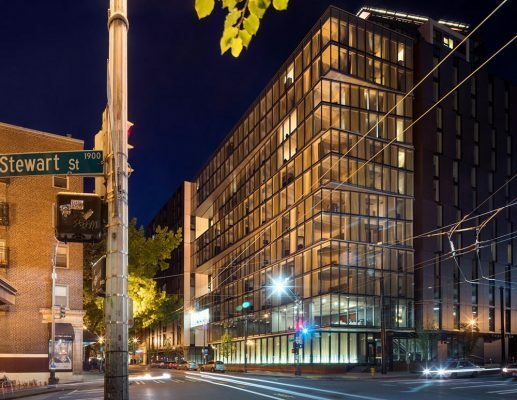 An 8-story podium is the base for the 500-foot tall hotel tower and covers most of a city block with 103,000 square feet of meeting and ballroom spaces, ground-level retail and an art-filled hotel lobby that welcomes visitors and guests. A mid-block pedestrian and vehicular passage through the podium connects to an existing alley to accommodate all loading dock, parking garage access, valet and drop-off services within the interior of the block, leaving the street perimeter free for continuous public space with wide sidewalks, street furnishings, and landscape. The placement of the tower on the south corner of the block relates it to the dense commercial high-rises of downtown and the new convention center expansion, while framing the Olive/Howell triangle as a significant space in the shifted urban street grid. 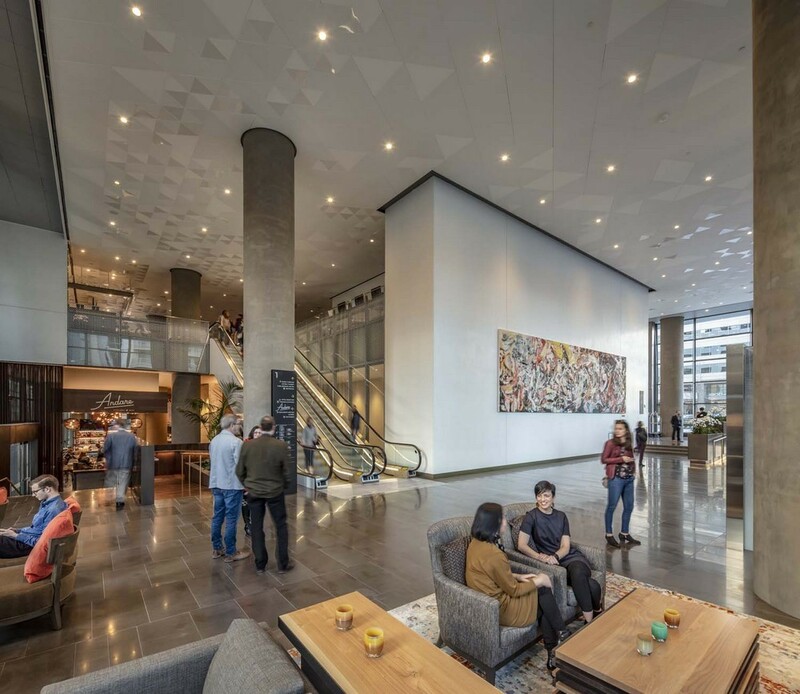 The building directly engages the city with its open, vibrant and active lower levels, which includes the lobby, porte-cochere, restaurants, bars, and shops. 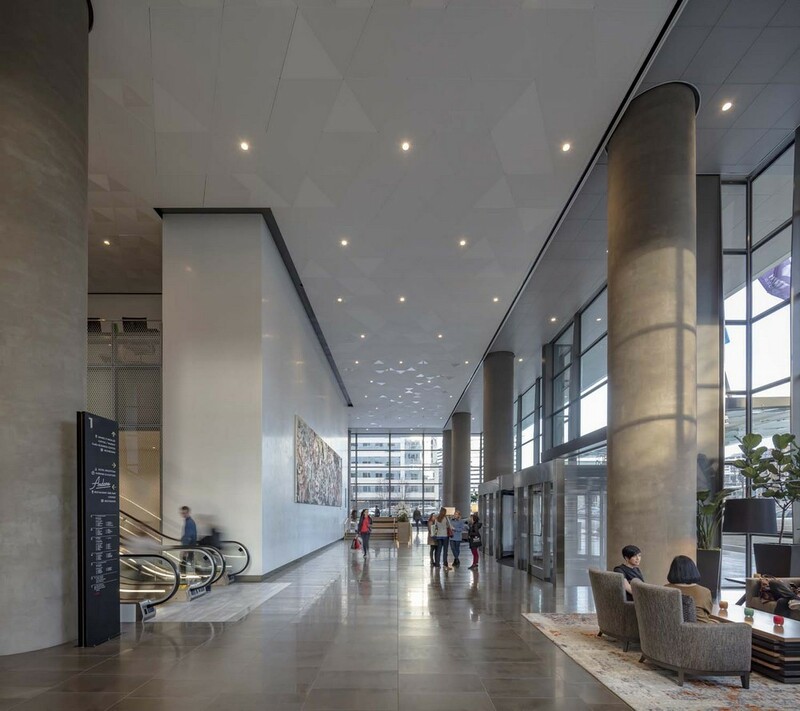 The ground level spaces blur the line between the lobby and the landscaped sidewalks, creating a holistic experience between the interior and the exterior of the building, and the life of the city. 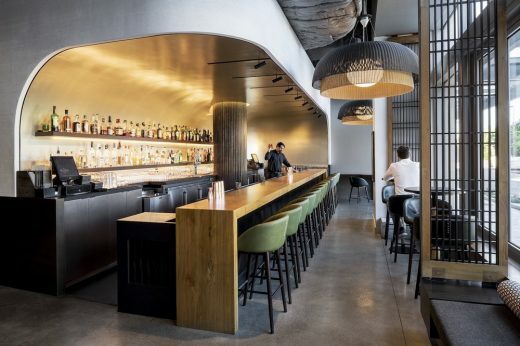 A prominent second level offers additional retail space, including a grab-and-go market, a bar and restaurant, and a lobby lounge space for the hotel and guests. 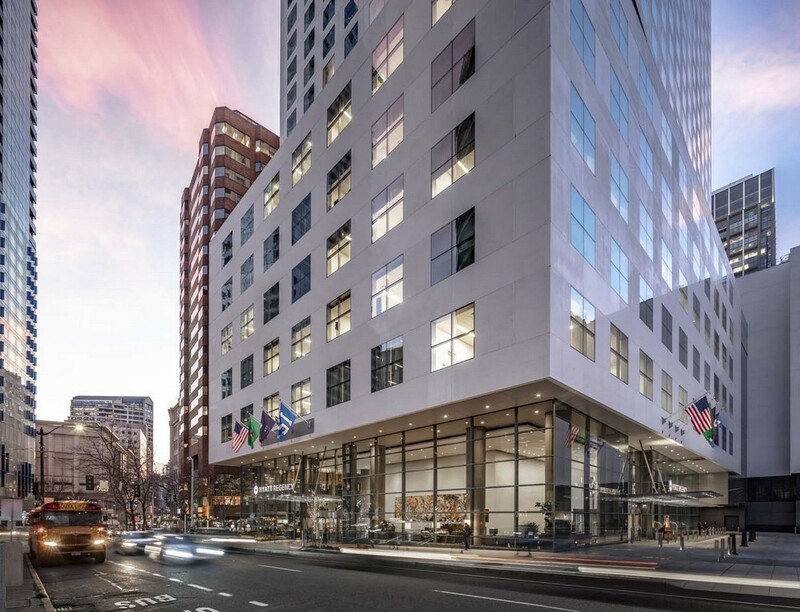 On the exterior, the building’s minimal material palette is composed of polished white concrete panel and structural glass walls to express the composition of public and private spaces, while reinforcing the connectivity of the public spaces to the city beyond. 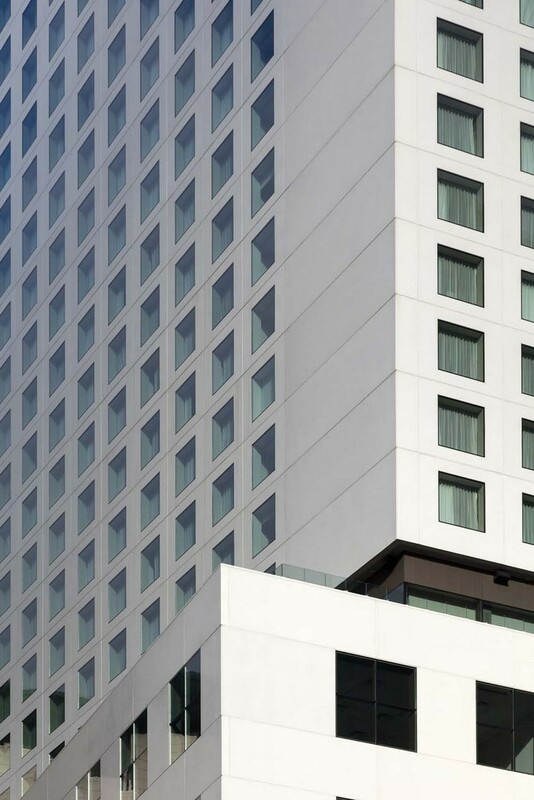 The white concrete podium is positioned over a transparent wall lining the sidewalk around the building. 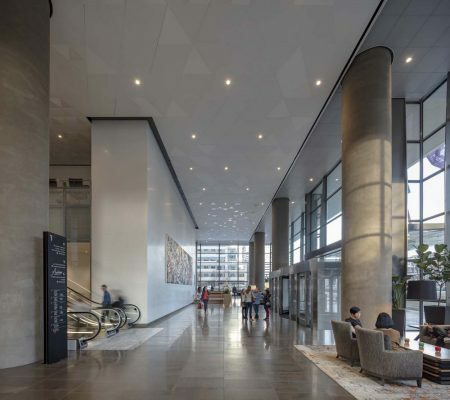 The glass wall, reaching up to 50-feet-in-height, achieves maximum transparency through the use of low-iron glass and a minimally intrusive stainless-steel vertical columns that feature a polished interior edge. The reflection from the polished edges provides a subtle play of light throughout the street-level public spaces. The tall ground floor lobby features full-height white, Venetian plaster walls, recalling the polished white concrete of the exterior. 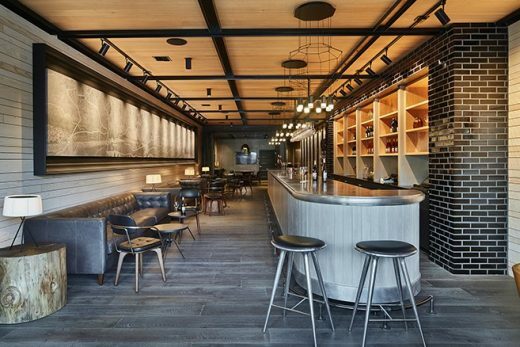 Stone and carpeted floors, fritted glass, locally-sourced wood finishes, and specialty casework and lighting fixtures round out the major interior materials. The project also adds notable contributions to the artwork within Seattle’s urban landscape. Throughout the building, paintings, photographs and sculptures have been curated to animate the building’s public spaces and guest rooms. Six local photographers were commissioned to provide some of the 1,260 pieces of room art, while large-scale artworks in the lobby provide a dramatic welcome to the reception area: Cecily Brown’s oil painting “Bring Me the Sunset in a Cup” spans 33 feet wide (by 9 feet high) across three linen panels, while a 5.7-ton black diorite and granite installation by Michael Heizer, “Black Diorite Negative Wall Sculpture,” explores negative space and nods to the region’s mountainous terrain. LMN Architects has designed a number of important projects in Seattle including Benaroya Hall, McCaw Hall, the Washington State Convention Center Expansion, the Foster School of Business Paccar Hall and the Paul G. Allen School of Computer Science and Engineering at the University of Washington, and the Museum of History & Industry, and the Seattle Aquarium Ocean Pavilion on the new waterfront. Other recently completed projects in the city of Seattle and the state of Washington include the Seattle Academy of Arts and Sciences Cardinal Union, Midtown21 Office Building, Sound Transit University of Washington Station, and the Federal Way Performing Arts & Event Center. 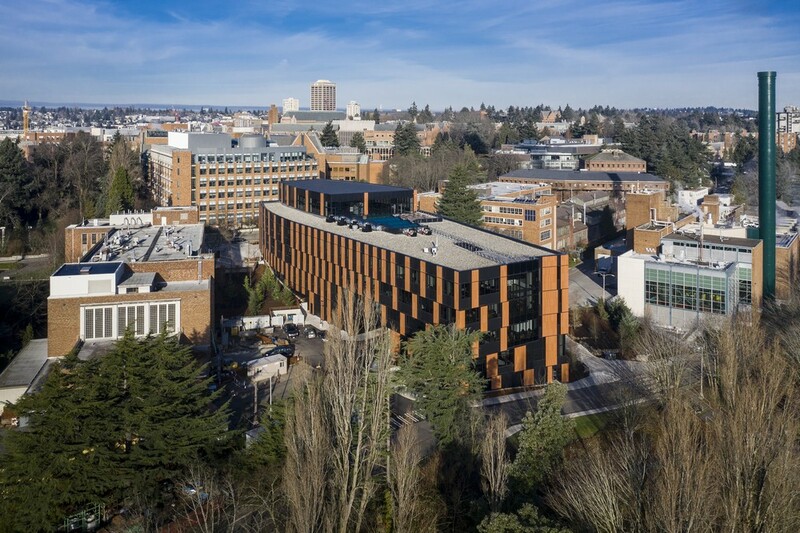 White polished precast concrete sandwich panel, stainless-steel curtainwall, white Venetian plaster, stone and carpeted floors, fritted glass, and locally-sourced wood finishes. Hotel composed of 1,260 Rooms, and various amenities including 4 Ballrooms, 52 Meeting Rooms, Business Center, Fitness Center, 2 Restaurants, Lobby Bar, and Market. (Interior design First Floor Restaurant, Eighth Floor Guest Amenities, and the interior design and furniture selection for the hotel rooms).